Awaking to a beautifully sunny day with a light wind, we decided to take the metro into Placa de Catalunya and take a walk down La Rambla. La Rambla is the cities most famous street, a long promenade, bustling with people and busy shops and stalls as well as live mime sculptures and the city Opera house. The street leads from the main square in Placa de catalunya down to the beautiful Port Vell. As we walk down La Rambla, taking in all the sites, it is clear to see what a metropolitan city Barcelona is. There is such a rich mix of people and cultures and La Rambla is the place where people come together, whether it is for shopping in one of the many stores or famous Boqueira market, sharing a meal or simply passing through. 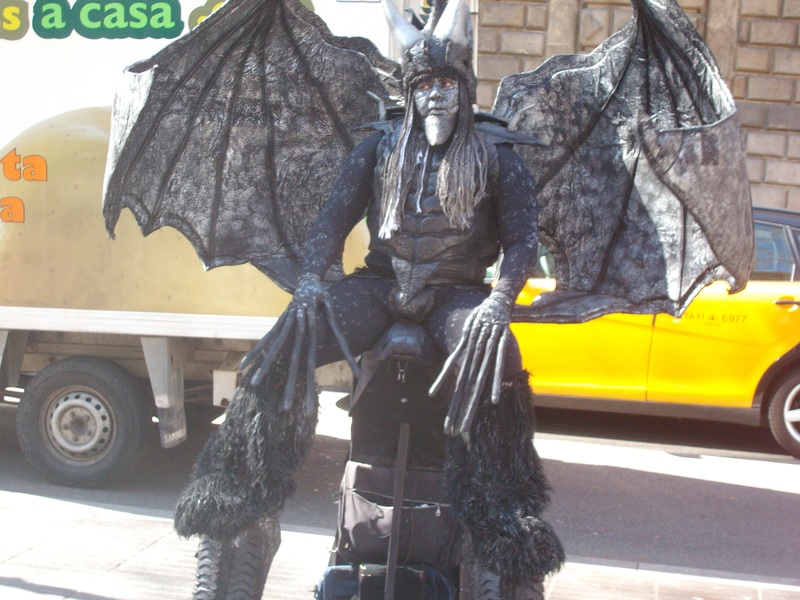 One of the highlights of La Rambla is the many live mime sculptures who appear in a variety of costumes and disguises. Some of them are very inventive and even scary, tempting you to put money down so they can surprise you with their act! Barcelona is known for its wide selection of markets, selling local produce such as fruit/veg, cheeses, herbs and spices and meat delicacies such as sheep’s head! La Boqueira is the well known market on La Rambla and a walk around here is a worthwhile experience, sampling all has to offer. 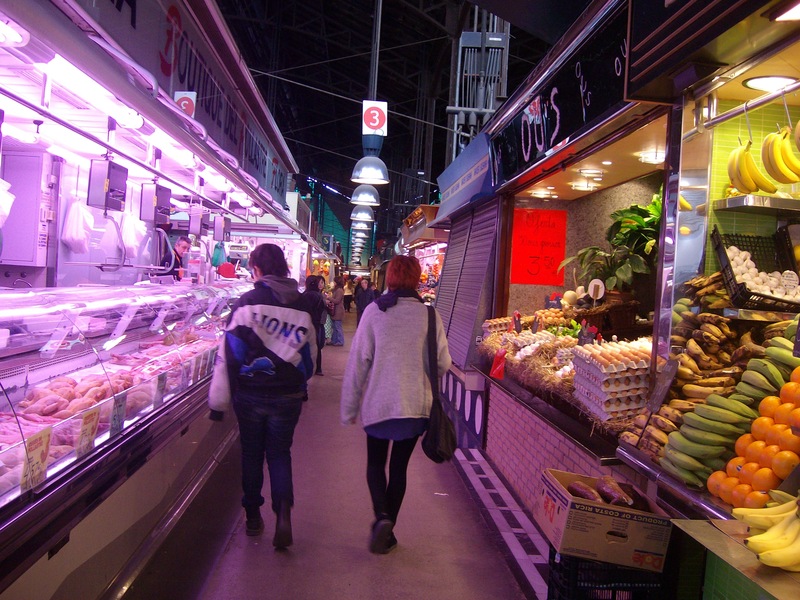 The market seems so lively and colourful, bustling with local people shopping for their evening meal. On La Rambla, I began to notice the architecture of Barcelona. Tall modernist style buildings with great detail in the stonework as well as areas of mosaic. Most of the buildings have been made into apartments for people to live in, with small balconies that reminded me of Paris or Verona. 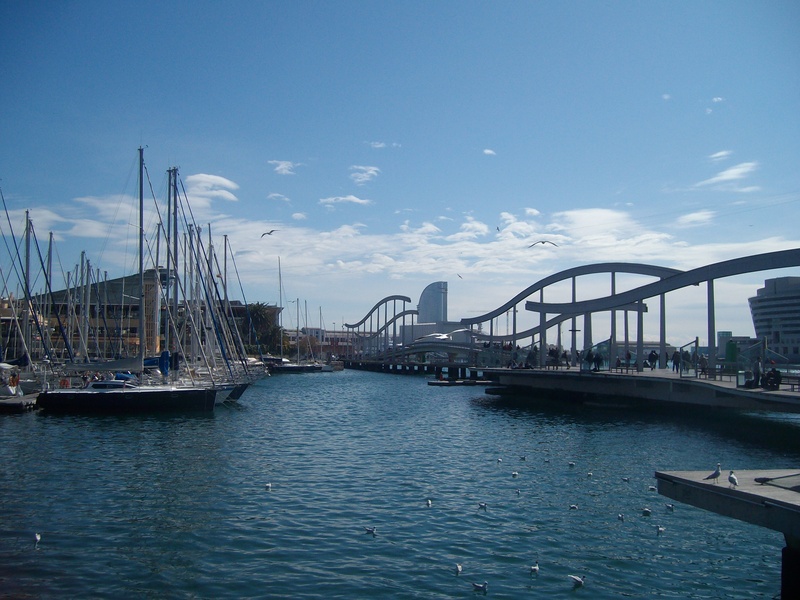 At the bottom of La Rambla is the magnificent Port Vell, which stretches as far as La Barcelonetta, the fisherman’s quarter and further to Port Olympic which was built in 1992 for the Olympic Games. This is the relaxing area of Barcelona, where you can walk along the promenade and take in the sea air, or simply sit and watch the world go by. There is also the impressive wave shaped footbridge which allows you to cross over the water and rotates to let boats in and out of the marina below. As we crossed, I looked out on perfect views of the city and mountains beyond. The world trade centre is also visible from the port, its boat shaped building very distinctive. At the other side of the bridge, there is a shopping centre, cafes, marine aquarium and IMAX cinema. In the evening we returned to La Rambla to one of the many restaurants for dinner. The atmosphere seems even more electric at night-time, with many more stalls open, selling gifts and souvenirs, bars and restaurants bustling with people and the old buildings lit up by old-fashioned street lights. And although the live mime sculptures had gone, they were replaced my others displaying their talents such as an artist who created beautiful almost myth-like paintings of small figures against the night sky, with a few cans of spray paint, a lighter and some bottle lids. The restaurants are quite traditional, serving tapas, pasta, pizza and paella. The tables were set up outside on the street, lit by low lighting and candles and patio heaters kept off the chill in the air. As we ate, sampling Spanish tapas such as meatballs, bread, meats and fish, and sipping Sangria, the setting felt very relaxing. I felt as though the city life did slow down after all, that once the sun has gone down, and the working day is over, this is what the people of Barcelona did to unwind. It is about spending time with family and friends and living for the moment, forgetting about the stresses of the day. A man appeared with an armful of red roses and offered one to us. I will admit, that in such high spirits, and a little drunk from the Sangria, I accepted and gave small change. How often do you get the chance to carry a rose across Barcelona city? It was a nice sight on waking the following morning! We arrive at Barcelona airport at 1pm local time. I find it hard to believe that in less than two hours we have crossed several european countries and arrived in Spain. The sky is an endless blue and as I step off the plane I immediately feel the warmth of the sun penetrating my many layers, dressed as I am, for uk weather. As I look around, I can see dry, rugged landscape in the distance, backed by high-rise buildings and roads looping over one another, taking the traffic into the city. In the far distance there are mountains, rising up towards the sunshine. I know that behind these, the sea stretches out for miles, because we have flown in along the coast, with a perfect view of the city and it’s port. I am incredibly excited to explore Barcelona. 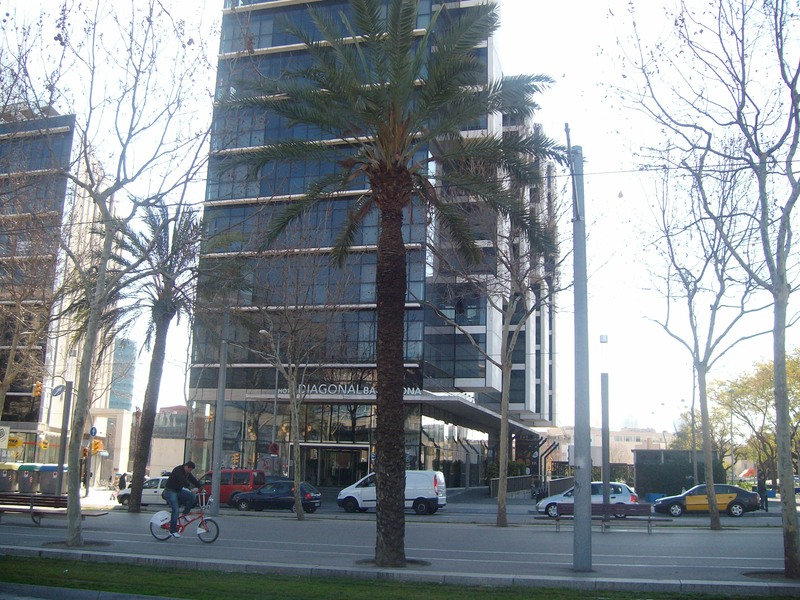 The first adventure we encompass, is to travel across this giant city, to our hotel in the Av Diagonal area of Barcelona. After several questions at the tourist information and a study of the map, we buy tickets for the aerobus which will take us into Placa de Catalunya, the centre of Barcelona. As we board the bus, with our suitcases and rucksacks (I never pack light!) we have our first taste of the Spanish city life. ‘Vamos, Vamos!’ our conductor shouts. And little do we know, this is one of many times we will hear these good-natured words. Everything is fast paced here. It is a 24 hour metropolitan city. And if you are one of many visitors, you must keep up! So we settle down for our drive across the city, sunglasses on and water bottles out. A pleasant kind of tiredness buried beneath our curiosity and excitement. The journey is quite a short one, taking us along the main roads that link the airport to the city. The outskirts of Barcelona is a collection of garages, supermarkets and other buildings, overlooking the dry, dusty land which backs on to small houses. As we approach the city centre, the buildings become more built up, and shops and cafe’s appear along the streets. Eventually we stop at the main square of Placa de Catalunya. It is an impressive area, with a large fountain at one end, and statues guarding the square at each corner. It is bustling with people and for a moment, we stand with our luggage taking it all in. Then we head towards the metro to make our way across to Av Diagonal. We are grateful that the ticket machines have an english option and manage to figure out which way we need to go. Then we go through the ticket points,without too much trouble and onto the platform. It strikes me how clean it is everywhere, the metro station is spotless and the train itself is also. People are very quiet and focused as they go about their day, but they are all to willing to help if you get into trouble, as we found on several occasions when we had a faulty ticket machine or a flight of steps to negotiate. Three stops later we arrived at Glories station, from which there was a short walk to our hotel. However first we had to carry our luggage up and down several flights of steps which seemed rather unnecessary! One young man very kindly offered to carry my friends suitcase, which she accepted but later admitted she was slightly concerned that if it had been any lighter, he may have run off with it! Such is the word that Barcelona is rife with pickpockets and thieves. Anyway, he only carried it up one flight of stairs before leaving us to struggle with the others! We saw the funny side once we had finally left the metro station. Sitting on our suitcases a few metres from the hotel, it feels perfect. The adventure has already started. Our hotel is the Silken Diagonal (see above) known for its modern design and architecture, the work of architect Juli Capella. The room is spacious and minimalistic, with twin beds, a television, mini bar, modern furniture and a perfect view of the city. The hotel stands next to the impressive Agbar tower, designed by architect Jean Nouvel who took inspiration from the water towers of Gaudi’s Sagrada Familia. 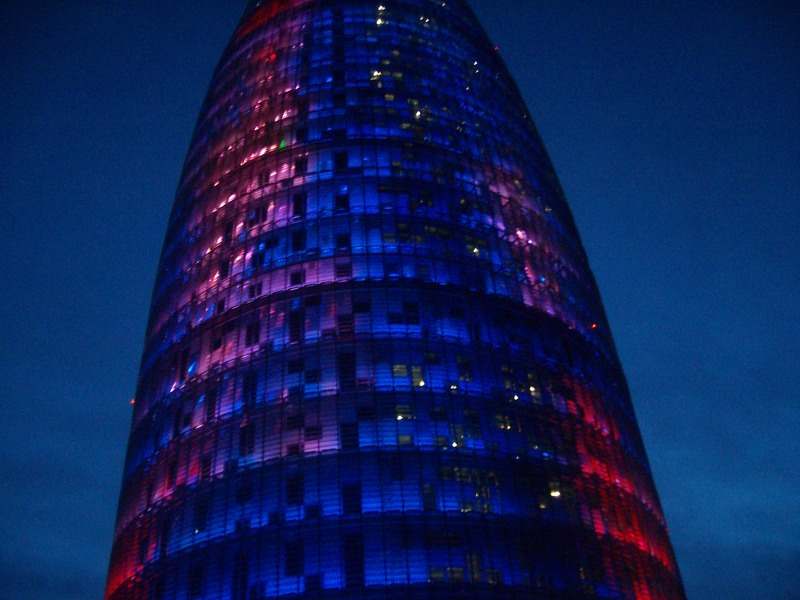 The tower is the headquarters of the Barcelona water company and it is recognisable in the skyline throughout the city, particularly at night when it is lit from below with colourful lighting. The hotel is quite central, with easy access to public transport to visit other areas of the city. Just a short walk from the hotel is the Glories shopping quarter, a selection of shops, cafe’s and restaurants and a Carrefour supermarket where local food and produce is cheap to buy. We explore this area after settling into the hotel before spending hours watching the Agbar tower illuminating the Barcelona Skyline. We quickly realise there is a lot to do in this cultural city, and we must make the most of the remaining two days we have here.